This article was also posted on the WRI blog, Insights. The financial sector is increasingly aware of the need to shift capital flows away from companies and activities that contribute to the climate problem and into climate solutions. However, they are just getting started in thinking through and strategizing on how best to respond—and tracking the climate progress of financial institutions has proven notoriously challenging. 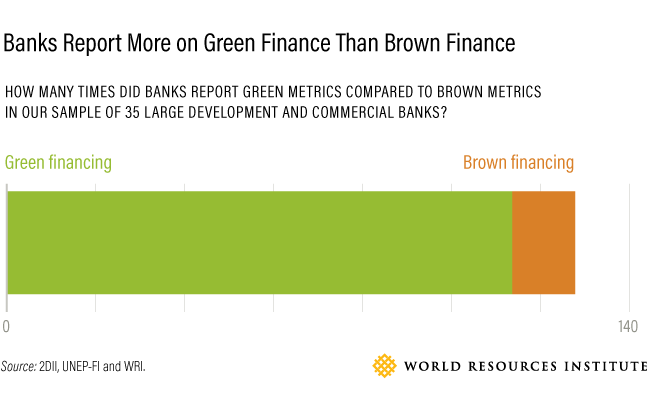 Our analysis of 35 large development and commercial banks found that, by and large, banks are unable to convey their overall climate progress. Many that report on climate-friendly "green" investments, for instance, do not fill in the other half of the picture by also reporting on financing of activities and technologies that contribute significantly to GHG emissions, known as "brown" investments. Banks—like any other financial institutions and businesses—are interested in taking advantage of the new business opportunities afforded by the low-carbon transition, through financing of sectors such as sustainable transportation and renewable energy. The world needs an additional $1 trillion per year, on average, investment in clean energy through 2050 to limit global temperature rise to no more than 2 degrees Celsius. Financial regulators are also increasingly concerned about risks to the financial system posed by climate-related threats. The Financial Stability Board's recommendations for effective disclosure of climate-related financial risks and opportunities is ushering in a new phase in norms and expectations around the issue of financial institutions' climate-related disclosure. In response, some financial institutions—including banks—are moving with speed and determination to understand, assess and disclose such climate-related risks, as shown by a recent UNEPFI-convened group of 16 banks piloting the recommendations and delivering the first publicly available methods for the industry to do so.